Stolby is one of the the oldest natural reserves in Russia. It was founded in 1925th by the initiative of the local people, who were fighting for the preservation of the forests and mountains of the area. The taiga landscape, followed by the forest-steppe sceneries, creates the natural diversity of the park. The name Stolby (Pillars) was given for the unusually shaped mountains - the landmark of the region. These mountains originally were chilled magma, which were hidden underground. During million years of erosion mountains came out and got the shape they have now. The most part of the Natural reserve, 90 percent of it, is restricted from visiting, but 4 percent is open to the public. In the early 19th century, this area was hardly visited, and rare guests would have to find their pathes in the woods without any road. Now it is well developed zone with tracking routes of different length and difficulty.There are 4 km routes for families with kids and longer 15 - 16 km pathes for more experienced travelers. 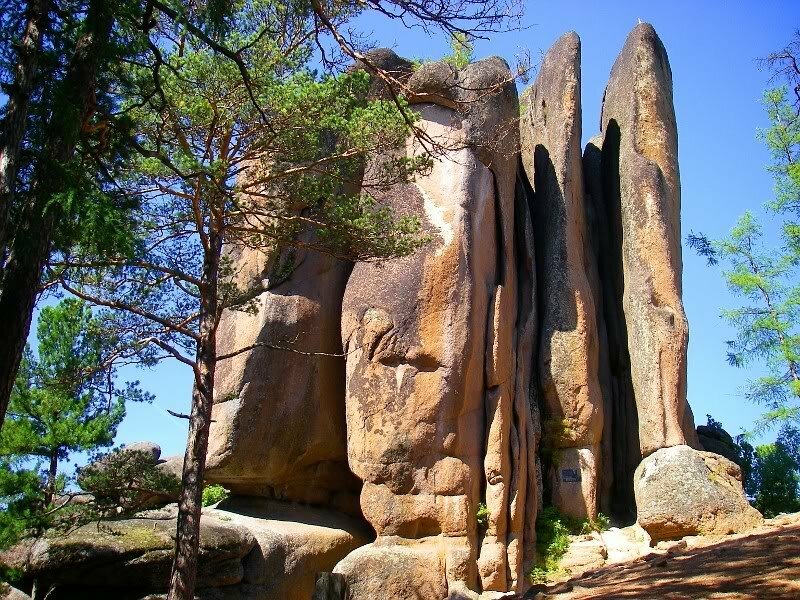 The part of the famous Krasnoyarsk Pillars (Stolby) which are open to the public are called "Central Pillars" (Tsentralnie Stolby). In total, the Natural Reserve has more than 100 "Pillars" with hight up to 90 meters. They have their own names and stories. Their silent presence was attracting many people, and many was totally captivated by them. Eventually, this passion turned into the movement called "Stolbism". This movement, wich was sport and nature oriented, was started in the early 20th century and has led to the creation of the natural reserve. Nowadays touristic area of the National Nature Reserve "Stolby" is a well kept zone, with comfortable wooden pathes, tent area, fire places and guest houses, which are suitable for people with disabilities. Guest houses were originally planned for the scientists and students, who would come to research flora and fauna of the reserve. From the Krasnoyarsk city there are several busses going to the area, trip from the bus stop to the border line of the Natural Reserve "Stolby" is 2 km, and to the mountain area 5 km more. In order to peacefully enjoy the nature and not to get lost, it is recommended to take a map at the entrance.